With the support of the Giving USA Foundation™, Lake Institute has produced a special report providing an in-depth analysis of charitable religious giving in America. The findings are striking and unambiguous: the likelihood of a person making a charitable contribution to either a religious or secular organization increases significantly with religious affiliation. While the total average annual contribution of households without a religious affiliation is $695, the overall average annual giving of households with a religious affiliation is $1590—regardless of the particular religious affiliation or identity. Religiously affiliated individuals are more than two times more generous with their financial contributions on average than those without a religious affiliation. So what do these findings mean for leaders of faith communities, nonprofits, and philanthropies? Practitioner Insight #1: Religiously affiliated households are financially more generous than the general public. Therefore, be willing to engage in conversations about giving. Over the past decade, Lake Institute has provided training for thousands of congregations across America. Through our seminars, public lectures, and presentations a common theme often emerges. Overall, we find religious leaders hesitant to discuss finances and charitable giving practices. Unsurprisingly, the academic literature has long confirmed our observation about clergy reticence. At least three studies conducted over the past 25 years have all reached the same conclusion: 1) clergy have a negative attitude towards money and 2) clergy are “reluctant” to discuss financial matters. In fact, Daniel Conway has written that of the dozens of clergy interviews he has done, religious leaders “felt that . . . money is incompatible with pastoral ministry and antithetical to . . . spirituality.” Yet, the findings released by Lake Institute and the Giving USA Foundation indicate that persons of faith are significantly more generous than the general population and are willing to give. Religious practitioners may take heart that conversations about charitable practices are already taking place within religious households. As Bill Enright has written, religious practitioners must be willing to enter into this conversation that is already taking place around families’ kitchen tables and encourage this as spiritual formation. 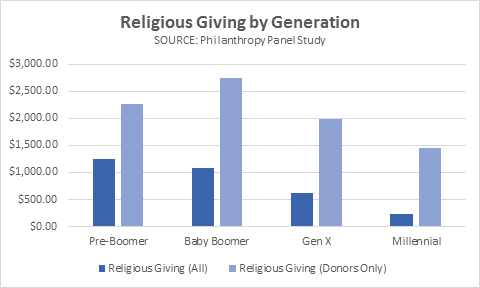 Practitioner Insight #2: Generational differences in religious giving may be less a result of the “generation” to which a person belongs and more a result of a person’s commitment to religious faith and practice. For years, religious practitioners have lamented the anemic giving patterns among younger generations to religious institutions. Some of these differences in charitable practices are more related to life stage than to generation. The report released by Lake Institute and the Giving USA Foundation cites an analysis by Indiana University’s Patrick Rooney, Xiaoyun Wang, and Mark Ottoni-Wilhelm finding that among donors to religious organizations, younger generations give on par with, if not slightly exceeding, older generational cohorts at the same life stage. At issue, therefore, is not so much the charitable practices of those who give but rather the overall participation of each generational cohort. The report indicates that just over half (55.3 percent) of pre-Boomer households make gifts to religious organizations. Participation drops among each successive generational cohort with 39.9 percent of Baby Boomer households, 31.2 percent of Gen X households, and 16.4 percent of Millennial households making charitable donations to religion. The findings are clear. If religious practitioners desire to increase charitable giving among any generation they will focus on the spiritual formation and involvement of their parishioners. The two single greatest predictors of charitable religious giving are matters of discipleship: worship attendance and involvement. Worship attendance predicts if a person will make a donation to your religious institution. Involvement often correlates with the amount they will give. For religious leaders, money and giving conversations cannot be ignored. Individuals and families are eager to engage them. At the same time, they cannot be separated from larger issues of spiritual development and religious life. These conversations must be holistic because they are connected. If you’re not thinking about the future of faith communities as well as families and local communities, then you are also missing a significant aspect of the work necessary to foster generosity. For the purposes of this report, giving to religion is defined narrowly as giving to congregations, denominations, missionary societies, and TV and radio ministries. Daniel Conway, “The Reluctant Steward” (Indianapolis, IN: Christian Theological Seminary, 1992); Daniel Conway, “The Reluctant Steward Revisited” (St. Meinrad, Indiana: St. Meinrad School of Theology, 2002); Christian Smith, Michael O. Emerson, and Patricia Snell, Passing the Plate: Why American Christians Don’t Give Away More Money (Oxford University Press, 2008). Conway, “The Reluctant Steward Revisited,” 8. Thad Austin, “Giving USA Special Report: Giving to Religion” (Indianapolis, IN: Giving USA Foundation, 2017), 21. The Giving USA Special Report on Giving to Religion released today was researched and written by the Lake Institute on Faith & Giving at the Indiana University Lilly Family School of Philanthropy with support from the Giving USA Foundation™. 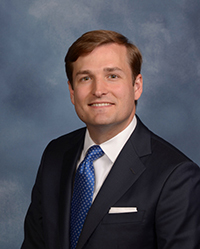 The report is based on newly released data from Lilly Family School of Philanthropy’s Philanthropy Panel Study (PPS), which tracks more than 9,000 individuals' and families' giving and dynamic factors that influence those practices (e.g., employment, health and marital status) throughout their lives. PPS is the leading and most accurate resource for measuring U.S. household giving. 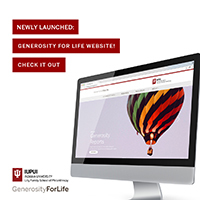 GenerosityForLife.org, which was made possible through the generous support of the John Templeton Foundation, is a new, interactive, online platform and unparalleled resource on charitable giving and volunteering in America. It tells the story of American generosity and offers a multifaceted look at giving by American individuals and families.